PERTH AMBOY, New Jersey, June 8, 2012 (ENS) – The City of Perth Amboy has agreed to make major improvements in its combined sewer system to protect public health and water quality under a legal settlement with the U.S. Environmental Protection Agency. Under the agreement, lodged by the U.S. Justice Department in federal court Wednesday, Perth Amboy will spend about $5.4 million for the repair, upgrade and expansion of the city’s combined sewer system and will also pay a $17,000 penalty. Combined sewer systems are designed to collect rainwater runoff, domestic sewage and industrial wastewater in the same pipe. During periods of heavy rainfall or snow melt, the volume of wastewater in a combined sewer system can exceed the capacity of the sewer system or wastewater treatment plant. When this happens, combined sewer systems overflow and discharge sewage directly to nearby water bodies. These overflows can contain not only stormwater, but also untreated human and industrial waste, toxic materials and debris. It is estimated that almost 370 million gallons of sewage flow into the Raritan River and Arthur Kill through Perth Amboy’s combined sewer system each year. Across New Jersey, 30 combined sewer systems discharge 23 billion gallons of sewage and other pollutants each year into all of New Jersey’s major water bodies. The Perth Amboy agreement requires the city to reduce the amount of sewage and other pollutants that flow out of 16 combined sewer points into the Raritan River and Arthur Kill, a tidal strait separating Staten Island, New York from mainland New Jersey. The EPA says Perth Amboy violated the Clean Water Act and its New Jersey Department of Environmental Protection discharge permit by failing to properly maintain and operate its sewer system, conduct regular inspections and have a pollution prevention plan in place. The city also violated a previously issued EPA order to address Clean Water Act violations. Under the new agreement, Perth Amboy will conduct annual inspections of all of its combined sewer system control facilities and will develop and implement a combined sewer overflow pollution prevention plan. “This settlement will require vital investments in sewer infrastructure that will help the city of Perth Amboy achieve compliance with the nation’s Clean Water Act. More than 70 percent of these repairs will take place in and benefit lower-income areas of the city,” said Ignacia Moreno, assistant attorney general for the Environment and Natural Resources Division of the Department of Justice. “This agreement will ensure that Perth Amboy’s combined sewer system is properly operated and maintained to minimize the number of untreated discharges to the Raritan River and the Arthur Kill,” she said. 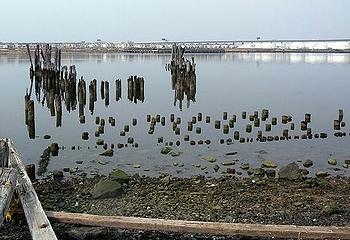 First settled around 1683, Perth Amboy features a historic waterfront, which has gone through a revitalization upgrade. This is where the city was first settled and one of the few places left in New Jersey that has a historic and marina culture surrounded by water. In response to the EPA’s earlier enforcement efforts, Perth Amboy has already completed a thorough inspection and engineering assessment of its sewer system. As a result of that study, the city will develop a plan to fix problems identified and do further work to separate the pipes so that some pipes will only carry wastewater from buildings to the wastewater treatment plant instead of a combination of domestic wastewater and stormwater. Work already underway and work that will be conducted under the legal settlement agreement will be completed by December 31, 2016.